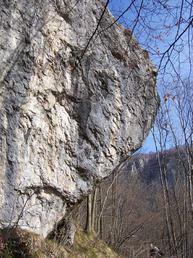 Large boulder, about 15m high, placed in Valgrande, upstream of Ballabio, in the heart of the woods, along the path that goes up towards Vaccarese and the Scudes of Valgrande. This repulsive-looking rock was discovered and partially bolted without making excavations by Marco Galli in the mid-eighties, and was then fixed to fix by Stefano Alippi who bolted and freed a few extreme shots on an overhanging wall. Climbing is very athletic and there are dug holds. These streets, often humid, are frequented sometimes in summer, given the coolness and shade, but they are very bad and require a high technical and physical level. Access: From the twelfth bend of the road that goes from Ballabio to Pian dei Resinelli (possible difficult parking on the curve) take a small road on the right. Follow it to a clearing where you park more comfortably (not advisable solution with mud or frozen ground) and from here continue on the path for about 10 minutes, passing the mines. After some ups and downs you will find the Sasso on the left (about 15 minutes). Falesie zona Lecco in settimana.